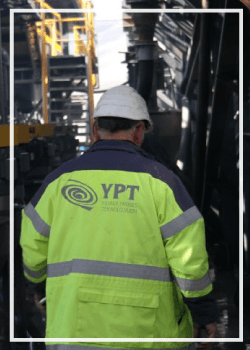 Yılmaz Process Technology ( YPT) is a dedicated mineral processing and extractive metallurgical company established in 2012 to service the international mining community. Our services includes; engineering of mineral processing and hydrometallurgical engineering equipment fabrication and systems. YPT has developed a strategic partnerships with a companies such as Scotia Int’l of Nevada / USA, McNally Baharat / India, Schenck Process /Avustralia along with many local fabrication facilities. Our team and strategic partners have worked together in numerous projects in the mineral processing and gold recovery industry. YPT is an Internatinally Certified Company with ; ISO 9001, OHSAS 18001, EN ISO 3834-2 and EN 10090-1. YPT is dedicated onto the principles of Health & Safety and demands a similar dedication from subcontracters and International Partners. Manufacturing and Assembly, application drawings. Determination of technical standards in accordance with process parameters.